You can see the little troops huddled up against the bottom of the box waiting for a Roco T-34/76 to come around the corner no doubt. 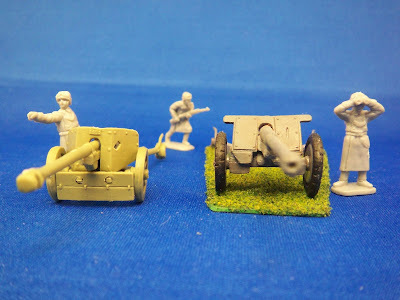 HaT makes a series of four WWII German artillery pieces. I have three of them so far and will discuss this one now. 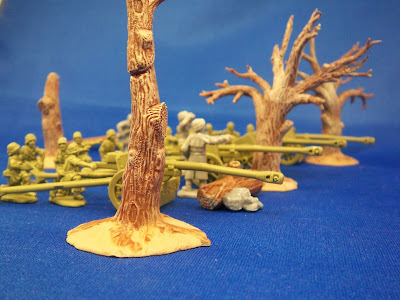 The other recent PAK 75 kit is this yellow one from Italeri. The Italeri one is rather chunky in comparison, but it's detail is more fine and more subtle. The Italeri one has a wheel hub that is closed unlike the HaT one that has an open wheel hub. The Italeri one looks better close up, but the HaT one looks better from a distance. Seen from the side, you can see the HaT gun is a bit lower in silhouette. 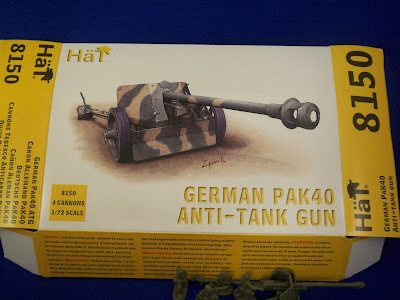 Here is the HaT WWII German Pak36(r) ATG alongside the PAK 40. Both of these are pretty big guns. 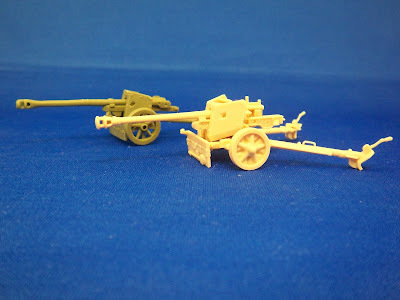 The HaT PAK 40 comes in a set of four, with four crewmen per gun. Here seen with a couple extra HaT military police for a pointing guy and a man with binoculars. These are IMEX trees. The muzzle break on the HaT gun is not fully open, but it would not be too hard to clear out. The Italeri one has an open muzzle break. The main differences are this: Italeri has a six man crew per gun and two guns in a set that costs about $10. The Hat Set has four guns with crews for about $8.50. This is a very common gun for WWII Germans, and both sets are good. The HaT set is perfectly fine for wargaming, the Italeri set has a slightly better gun, but costs over twice as much. 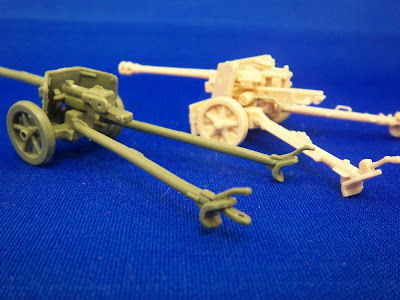 If I wanted a really nice gun, I would not get the Italeri gun, I would buy a real styrene kit of a PAK 40, they are pretty common.